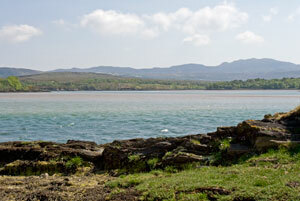 Doe Castle is found in a peaceful setting in County Donegal in Ireland's Northwest region. The 16th century monument is a four-story keep surrounded by towers and defensive walls. The castle is in a beautiful remote location on Sheephaven Bay, which is northwest of Letterkenny and south of Creeslough. On a beautiful Spring day, I visited the castle and then made my way to Glenveagh National Park and Glenveagh Castle by driving the back roads. It’s a nice way to see the less traveled areas of Ireland's Northwest. 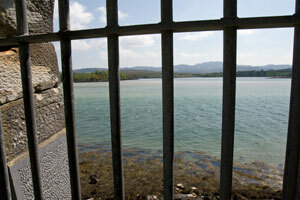 Three sides of the tower house of Doe Castle are on the waters of the bay. The fourth side is a moat carved into rock. The view from the battlements is worth the climb. If the gate to the stairway is locked, you can get the key if the caretaker is in his home near the castle. The castle was a strategic structure on the Irish coast throughout its history. It was the ancient seat of the Chiefs of Doe, the MacSweeneys, many of whom are buried in the nearby burial ground. The MacSweeneys occupied the castle for 200 years and ruled the area which included nearby Tory Island. Sir Cahir O'Doherty took possession when he attacked Derry in the 1600s. 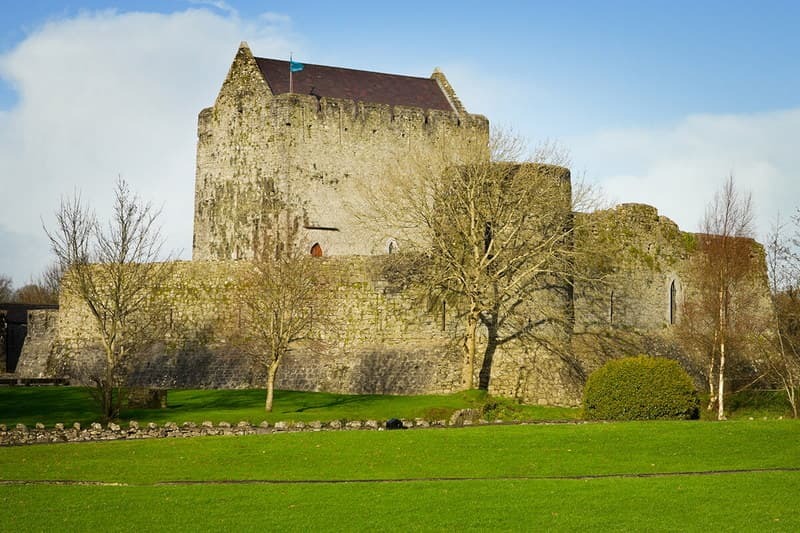 The MacSweeneys came back in the 1640s and Eoghan Rua O'Neill landed at Doe Castle when he came from Spain in 1642 to lead the Irish Confederate Army. In about 1660 English soldiers took possession and in the 1690s the MacSweeneys were once again in control. Several owners occupied the castle until 1909. In 1932 the government of Ireland bought the property and named the castle a National Monument. The Office of Public Works maintains the castle today and continues to work on restoration. 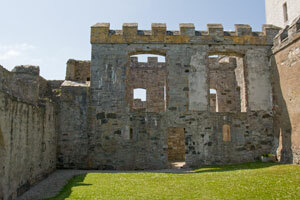 One of the legends of Doe Castle involves a Romeo and Juliet-type romance. Aileen, the daughter of Maolmhuire of Doe, was in love with Turlough, the son of the O'Boyles from Ballymore. Turlough hunted deer near the castle and met Aileen. The families hated each other. Aileen's father heard of the romance and locked Aileen in the castle tower. Turlough fished in the nearby Lackagh River in hopes of seeing his beloved. The MacSweeneys captured him and took him to the castle. Aileen looked out the window one night and saw the dead body of her lover. She was horrified and jumped from the tower to her death. It is said that to this day, the ghosts of Aileen and Turlough are seen rowing their boat on Lackagh River. 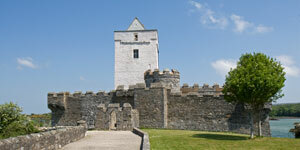 To visit the castle, take N56 northwest from Letterkenny. Follow the signs to turn off of the N56 onto R245 and continue for about three and one-half miles to the castle. When you visit the castle, you may want to continue northwest on the N56 and take the ferry from Magheroarty Pier to scenic Tory Island.